The subjunctive…Is there anything else that instills fear in Spanish Students around the globe as the dreaded subjunctive? Why are kids so scared? It’s Spanish Teachers’ fault! Stop it! Stop teaching a complicated lesson about noun clauses. 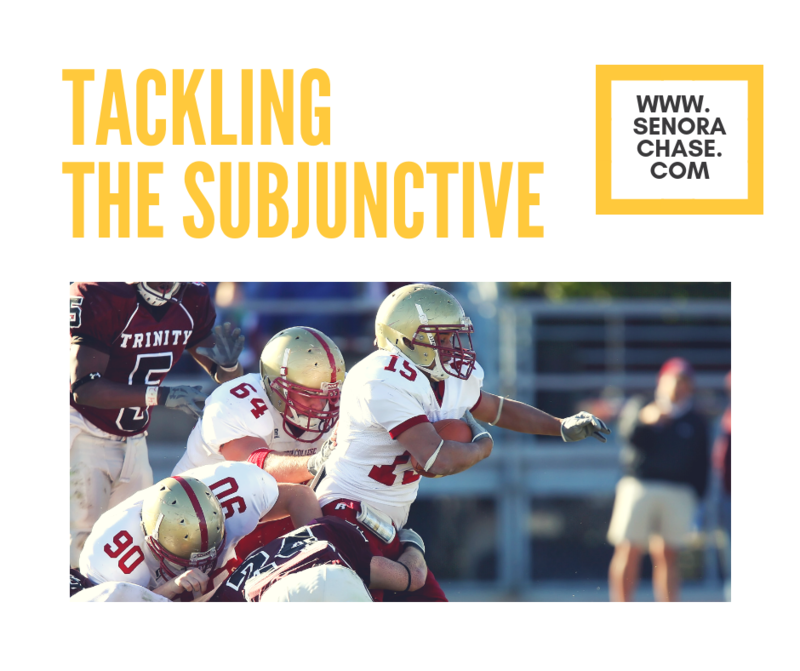 Stop treating the subjunctive like a textbook unit. Stop stressing them out! Just stop it! ¡Es importante que escriban sus nombres en los papeles! Quiero que bailen con Shakira. ¿Quieres que te cantemos Feliz Cumpleaños? ¿Están tristes que haya escuela hoy? ¿Esperan que mañana nieve mucho y que no haya escuela? ¡Que tengan buen día, chiquitos. Pido que no hablen durante la celebración de conocimiento. You know what they DON’T hear? Since this is an impersonal expression, I used the present subjunctive, escriban. See that, since I changed the subject, I said bailen and not bailan, I changed the AR ending into an E. Haya is actually an irregular subjunctive verb of Haber. Stop it! Don’t do it! Why over complicate and confuse your little darlings?! Impress your linguist friends with that kind of talk…leave the kids out of it! They hear the subjunctive all the time. They understand the message. That’s enough. Leave it at that…. in the lower levels anyway! (We’ll talk about upper levels in a minute.) I consciously use the subjunctive A LOT, but like everything else we do in class, it’s nice and slow and comprehensible. And my only concern is that they understand the message. But what if they ask? What if they say, “what does ‘haya’ mean?” “It means, ‘there is’.” Just leave it at that. If they’re really insistent and what to know why, chat with them after class and dazzle them with your polished grammar explanation…but there’s no reason to burn up precious class time and stress everyone else out. Ok, this is the part I’m nervous to write. I’m nervous because I don’t want the CI BIG NAMES to rip me apart because this is more “conscious learning” and not so much “subconscious acquisition” and I don’t want the CI BIG NAMES to write me off as “not really a CI teacher” and then my little blogcito shrivels up and blows away…those are the things I worry about late at night. And a TON of input with little “Grammar Pop Ups” sprinkled in. A Grammar Pop Up is a quick 10-15 second explanation or question to reinforce a grammar point. It sounds like this: “Why did I use the subjunctive there? Yep! We have 2 different subjects, a que and a DIED verb!” OR “Is ‘quiere’ a DIED verb? You betcha, it’s a verb of Influence”. So in class, think of lots of ways to give them examples of the subjunctive ALL. Year. Long. Do what you do. Give them lots of input. And target structures that require the subjunctive. Movie Talks- No matter the clip, you can surely work in lots of great subjunctive! Cierto/ Falso game– with examples in the subjunctive, like when she was little, Mrs. Chase’s parents wanted her to become a doctor. True or False? Card Talk- Think of prompts that would elicit the subjunctive. Things like Draw what you want your teachers to do or What should kids do in Spanish Class or What are the rules in your house? Set up prompts that require the subjunctives and then use their cards to give them tons of beautiful subjunctive: Miren, muchachos, ¡Cole quiere que sus maestros le dén dinero! ¿Quieren que sus maestros les dén dinero? ¿Cuánto quieren que les dén? OR En la clase de español, es importante que los estudiantes canten. A la Sra. Chase le encanta cantar y ella insiste que los estudiantes canten. ¿Sus otros maestros insisten que canten en sus clases? ¡¿NO?! OR… you get the picture. Tons of opportunities for subjunctive input! PQA– Teach and target chunks of language. Maybe you introduce the phrase “espera que gane” and you ask lots of questions, ensuring lots of repetitions of your phrase. Right now we’re in the middle of Locura de marzo so we’ve been using this one a lot: ¿Quién espera que la canción “Puebla” gane? ¿Quién espera que la canción “échame la culpa” gane? ¿A quién no le importa? ¿Cuál canción esperas que gane? Now I’ll preface this that I don’t know if this actually works. My students have reported that it’s helpful, but I don’t know of any study that supports this technique. In fact, it might actually hinder acquisition because it it makes it conscious and not subconscious. And I also worry this might push the CI BIG NAMES over the edge and they’ll kick me out of their CI club…BUT, in my Spanish 4 class, I ding a bell when I use the subjunctive! There! I said it! I feel much better! It really helped me get a grip on the subjunctive mood! Just the act of setting up the subjunctive, and pausing to get my bell gives me just enough time to make sure I’ve got my subjunctive correct. Which helps them because it slows me down AND because I’m giving them good, clean input! WIN WIN! This year, one of my little darlings I taught last year in Spanish 4, that’s in AP this year told me, “I swear to you…when I’m writing or speaking and I say say something, I actually hear the bell in my head when I need to use the subjunctive”. Hey…maybe it did have some sort of subconscious effect after all. So….my dirty little grammar secrets are out! Will you still be my friend? Haha! “Wait” does roll off so easily!! In Japanese it does too “ma-te, ma-te, ma-te”. My husband speaks Japanese and he’s always saying that to me! But you’re right “esperen” is so many syllables! !